Despite the recent progress in financial integration and some debt reduction in many countries, the architecture of the euro area remains incomplete, especially when it comes to dealing with macroeconomic shocks. In a monetary union, countries cannot use independent monetary policy or exchange rate flexibility to mitigate shocks and support growth or employment. In the euro area where labour mobility remains low, partly due to language differences, private risk sharing mainly takes place through cross-border flows of capital and credit, which are not always sufficient to deal with large negative shocks. Furthermore, financial markets in Europe remain fragmented along national lines, so that quick reversals of cross-border interbank lending can occur in periods of crisis – precisely when private risk sharing would be needed the most (Furceri and Zdzienicka 2015). The critics of a central fiscal capacity usually dismiss its usefulness by pointing out the strong role of national fiscal stabilisers and the need to deepen the ongoing financial integration (Heijdra et al. 2018, Feld 2018). Indeed, automatic fiscal stabilisers to dampen shocks are more powerful in the euro area than in the US (Alcidi and Thirion 2018). Adopting a balanced budget in structural terms, in adherence to the Medium-Term Objective, should provide enough room for automatic stabilisers in ordinary cyclical situations. Following that rationale, what would be needed is basically a faster debt reduction and more sound public finances in all euro area countries brought about, if necessary, by introducing a sovereign debt restructuring procedure (GCEE 2018). Moreover, the argument goes, private financial flows are now more stable than prior to the crisis because of the progress in the Banking Union and the public risk sharing provided by the European Stability Mechanism (ESM), whose salutary effects can already be observed in the data (Milano 2017, Cimadomo et al. 2018). Hence, it could seem that instead of devising further public risk-sharing instruments, the highest priority should be a deepening of financial integration – most importantly, swift completion of the Banking Union and Capital Markets Union. On closer look, however, there are good reasons for complementing the national automatic stabilisers and the ongoing financial integration with a common fiscal instrument. First, financial integration in the euro area – through both the Banking Union and the Capital Markets Union – will only be achieved gradually given the cultural, linguistic and institutional hurdles, and will require further tax harmonisation, insolvency law harmonisation and an increased supply of pan-European investment products (Véron and Wolff 2016, OECD 2018). Second, and more importantly, fiscal risk sharing is a clear complement to national fiscal stabilisation from a welfare perspective as long as financial integration does not achieve complete financial markets (which is not the case even in the US). Fiscal risk sharing diversifies risk across a group of countries, while national automatic stabilisers only amount to self-insurance. Indeed, with a common fiscal tool, the resources available to address a negative shock are no longer tied to domestic income but to that of all union members, and this is true even with sound national fiscal policies and well-functioning financial markets. Moreover, private risk sharing via financial markets may be in short supply, as private agents may not internalise indirect effects of their actions on aggregate macroeconomic stability. The problem is particularly severe in a currency union, where neither national fiscal policy nor financial integration alone are necessarily sufficient for an efficient outcome (Farhi and Werning 2017). The difference in stabilisation outcomes can be substantial, with the combination of fiscal risk sharing and national stabilisers improving welfare outcomes by about one third compared to using national stabilisers alone. We are able to confirm similar stabilisation gains in our general equilibrium model implementing a negative demand shock in the periphery (see the appendix for a description). 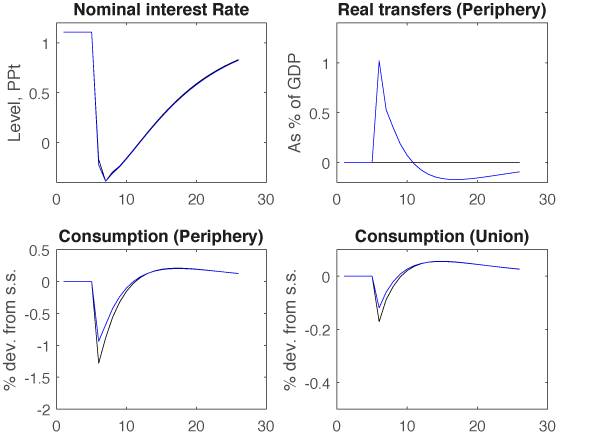 With national fiscal stabilisers only (black lines in Figure 1), periphery consumption drops by 1.3% and union consumption drops by 0.2%, both compared to the steady state.1 The central bank reacts to the shock by cutting its interest rate down to -0.4%, as for now we assume that there is no zero lower bound on monetary policy. We compare this baseline case with a scenario where a fiscal capacity entitled to borrow in financial markets provides support in times of shocks (blue lines in Figure 1). Both countries finance the fiscal capacity, implying fiscal risk sharing. The same negative demand shock now triggers fiscal transfers to the periphery of about 1% of its GDP. This support upholds periphery consumption, which drops by only 0.9% compared to the steady state, while union consumption decreases by only 0.1%. Hence, the fiscal capacity complements existing national stabilisers and further mitigates the negative shock. Fiscal risk sharing brings risk diversification and improves consumption of the households who optimise inter-temporally, while transfers support the current disposable income of those without access to financial markets. Note: Black lines: scenario without transfers; blue lines: scenario with transfers. The theoretical insights are confirmed by empirical work showing that national automatic stabilisers may not be sufficient to counter big demand shocks. As cyclical changes in headline balances in the euro area typically exceed 3% of GDP every 10 years and 5% of GDP every 20 years, fiscal risk sharing would indeed provide insurance for the benefit of the whole Economic and Monetary Union (Carnot and Buti 2018). The weak potential growth and inflation outlook for the euro area also suggests that nominal interest rates may stay close to zero for a prolonged period of time and return close to zero more often in the future (Rachel and Smith 2017). In a situation when policy interest rates face an effective lower bound, a common fiscal stabilisation instrument would amount to an important addition to macroeconomic stabilisation. We quantify this effect with the second DSGE simulation. We implement the same negative demand shock in the periphery as before, but now with a zero lower bound on monetary policy, which curtails the stabilisation power of the central bank. Starting with a baseline without fiscal risk sharing (black lines in Figure 2), periphery consumption now drops by 1.6% compared to the steady state while union consumption drops by 0.5%. 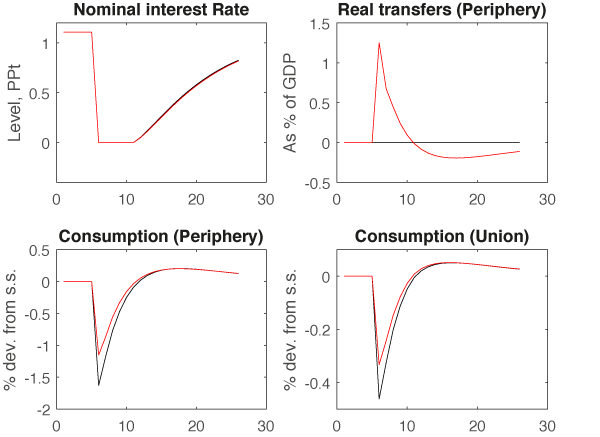 Then, as the fiscal capacity steps in (red lines in Figure 2), transfers of about 1.3% of GDP flow to the periphery, and consumption drops by 1.2%, while the union consumption decreases by only 0.3%, both compared to the steady state. Hence, the fiscal capacity improves macroeconomic stabilisation when the central bank is constrained. When the central bank faces an effective lower bound, the fiscal capacity is then effective at complementing monetary policy on top of existing national stabilisers. Note: Black lines: scenario without transfers; red lines: scenario with transfers. In our companion paper (Claveres and Stráský 2018b), we discuss a common fiscal stabilisation instrument in the form of an unemployment benefits reinsurance scheme. Our design combines elements of several existing proposals, which have not yet been analysed within one scheme (Table 1). In particular, we use a double condition trigger that activates the support from the scheme when the unemployment rate is both increasing and above a long-term average (European Commission 2018). Other features include stop-go contributions depending on the level of the fund balance (Beblavý and Lenaerts 2017) and an experience rating system charging higher contributions after pay-outs (Arnold et al. 2018). Our scheme addresses moral hazard through several channels. The double condition trigger implies that the common scheme only covers part of negative shocks – those where the unemployment rate is increasing at high levels compared to the past. This feature represents a form of deductible, since the shocks occurring when the unemployment rate is low, compared to the long-term average, are stabilised at the national level. Then, we insist on past compliance with EU fiscal rules (although this condition is switched off in the counterfactual simulations). We also incorporate experience rating, whereby contributions increase gradually after pay-outs, and we limit the cumulated net transfers to 5% of national GDP. Our scheme also does not require a strong convergence in labour market institutions across EU countries or adjustments in national insurance policies. Although payments towards countries are proportioned to the size of the unemployment increase, they are also capped (cumulated payments cannot exceed 5% of the country’s GDP), ensuring that pay-outs to individual countries are limited. These features, together with a mechanism charging higher contributions to countries that draw more frequently on the fund (experience rating), effectively prevent permanent transfers in the medium term. Using counterfactual simulations of the proposed mechanism for individual euro area countries on annual data from 2000 to 2016, we show that the scheme would have delivered stabilisation gains, both at the individual country level and euro area level. As usual in the literature relying on simple counterfactual simulations (e.g. Carnot et al. 2017), our calculations based on historical data leave out dynamic and general equilibrium effects but provide an approximate assessment of the stabilisation potential. The standard deviation of euro area real GDP growth from 2000 to 2016 amounts to 1.8%. We calculate a counterfactual standard deviation (when transfers are added to actual GDP) of 1.6%, roughly a 10% reduction. Macroeconomic stabilisation would be timely in most cases and achieved at the cost of limited debt issuance (less than 2% of the euro area GDP), with average annual contributions not exceeding 0.17% of GDP (Figure 3). It would have also avoided permanent transfers among countries, as none of them would have been a major net contributor or receiver with respect to the scheme. It is also interesting to note that most countries would have benefited from the scheme at one point in time, including fiscally prudent countries such as Germany or Luxembourg. Arnold, M, M Barkbu, H Ture, H Wang and J Yao (2018), “A central fiscal stabilization capacity for the Euro Area”, IMF Staff Discussion Note SDN/18/03. 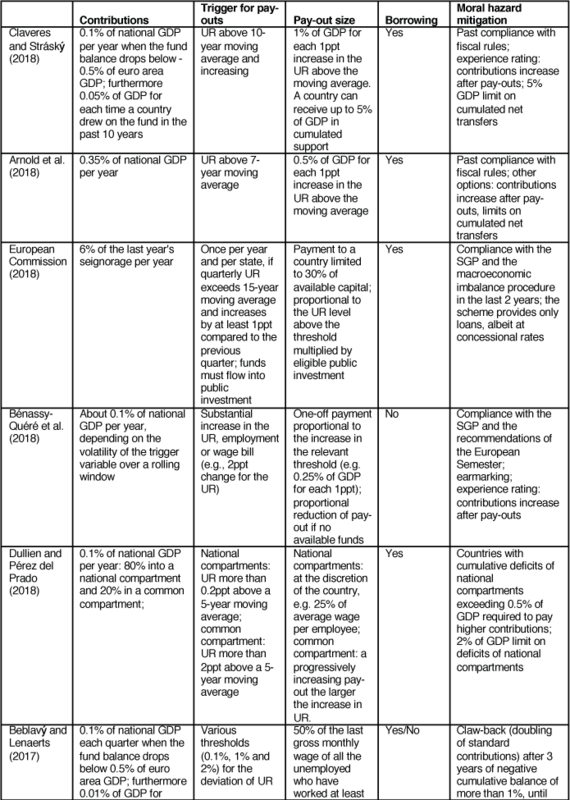 Beblavý, M and K Lenaerts (2017), “Feasibility and added value of a European Unemployment Benefits Scheme”, Centre for European Policy Studies, Brussels. Bénassy-Quéré, A, M Brunnermeier, H Enderlein, E Farhi, M Fratzscher, C Fuest, P-O Gourinchas, P Martin, J Pisani-Ferry, H Rey, I Schnabel, N Veron and B Weder di Mauro and J Zettelmeyer (2018), “Reconciling risk sharing with market discipline: A constructive approach to euro area reform”, CEPR Policy Insight No 91. Carnot, N and M Buti (2018), “The case for a central fiscal capacity in EMU”, VoxEU.org, 7 December. Carnot, N, M Kizior and G Mourre (2017), “Fiscal stabilisation in the euro area: A simulation exercise”, CEB Working Paper No. 17/025, Université Libre de Bruxelles - Solvay Brussels School of Economics and Management. Claveres, G and J Stráský (2018a), “Euro area unemployment insurance at the time of zero nominal interest rates”, OECD Economics Department Working Paper No. 1498, OECD Publishing, Paris. Claveres, G and J Stráský (2018b), “Stabilising the euro area through an unemployment benefits re-insurance scheme”, OECD Economics Department Working Paper No. 1497, OECD Publishing, Paris. Dolls, M, C Fuest, F Heinemann and A Peichl (2016), “Reconciling insurance with market discipline: a blueprint for a European fiscal union”, CESifo Economic Studies 62(2): 210–231. Dullien, S, J Fernández, M López, G Maass, D del Prado and J von Weizsäcker (2018), “Fit for purpose: a German-Spanish proposal for a robust European Unemployment Insurance”. Farhi, E and I Werning (2017), “Fiscal Unions”, American Economic Review 107(12): 3788-3834. Furceri, D and A Zdzienicka (2015), “The euro area crisis: Need for a supranational fiscal risk sharing mechanism?”, Open Economies Review 26(4): 683-710. German Council of Economic Experts (GCEE) (2018), Annual Report 2018. Heijdra, M, T Aarden, J Hanson and T van Dijk (2018), “A more stable EMU does not require a central fiscal capacity”, VoxEU.org, 30 November. OECD (2018), OECD Economic Surveys: Euro Area 2018, Paris. Rachel, L and T D Smith (2017), “Are low real interest rates here to stay?”, International Journal of Central Banking 13(3): 1-42. Véron, N and G Wolff (2016), “Capital Markets Union: A Vision for the Long Term”, Journal of Financial Regulation 2(1): 130-153. In Claveres and Stráský (2018a), we adopt a two-region New-Keynesian DSGE model of the euro area and use it to quantify potential stabilisation benefits offered by a euro area fiscal capacity. We do so both in normal times, from the point of view of monetary policy transmission, and when monetary policy becomes constrained by a zero lower bound. The model features imperfect risk-sharing mechanisms as well as various sectors and frictions to reproduce a rich set of general equilibrium effects. Two countries, which we call core and periphery, compose the union. In each country, a national government can run a counter-cyclical tax policy and issues debt on financial markets bought by households. Only a fraction of households has access to these financial markets, while others are financially constrained and only consume current disposable income, which reduces private risk sharing. Both household types consume a basket made of core and periphery goods with a degree of home bias. Firms produce goods and post vacancies in frictional labour markets. Unemployed people receive benefits from their respective national government. We calibrate the model to reproduce key euro area stylised facts at the steady state and over the cycle. The core represents 60% of total union size, and is more productive with a more efficient labour market than the periphery. The share of credit constrained households is set to 50%. In the scenario with fiscal capacity, we introduce a common scheme that provides support directly to households in times of shocks. In that sense, the capacity could represent a form of common unemployment insurance scheme providing emergency benefits when a crisis hits. A transfer rule ensures that transfers only occur outside the steady state. These transfers are financed by debt issuance as well as taxes on both countries, bringing a channel of fiscal risk sharing compared to the baseline.